Fig.1. 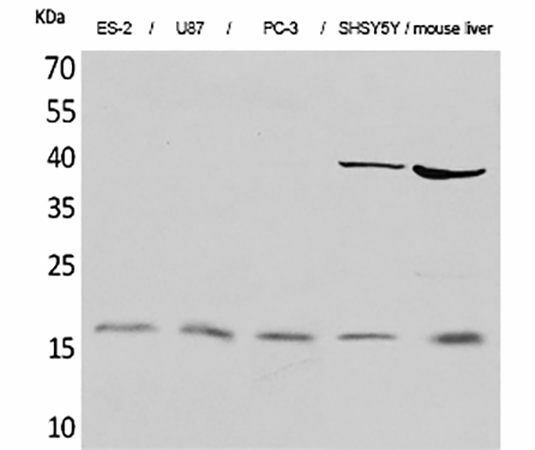 Western Blot analysis of ES-2 (1), U87 (2), PC-3 (3), SHSY5Y (4), mouse liver (5), diluted at 1:2000. Fig.2. Immunohistochemical analysis of paraffin-embedded human uterus tissue. 1, IL-1β Polyclonal Antibody was diluted at 1:200 (4°C, overnight). 2, Sodium citrate pH 6.0 was used for antibody retrieval (>98°C, 20min). 3, secondary antibody was diluted at 1:200 (room temperature, 30min). Negative control was used by secondary antibody only. Fig.3. 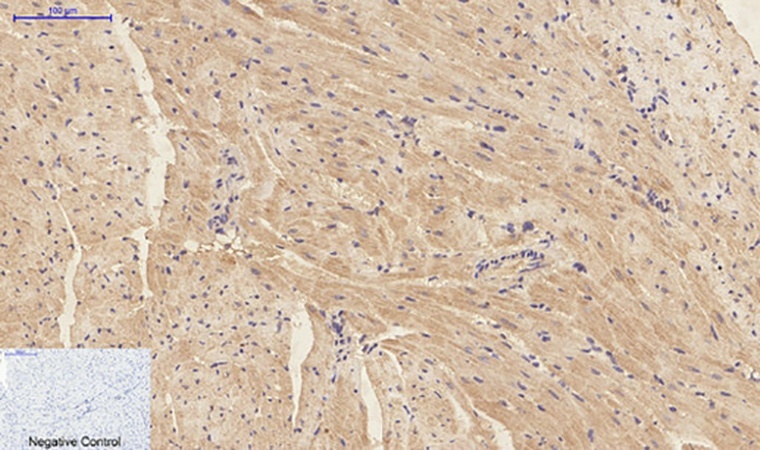 Immunohistochemical analysis of paraffin-embedded mouse heart tissue. 1, IL-1β Polyclonal Antibody was diluted at 1:200 (4°C, overnight). 2, Sodium citrate pH 6.0 was used for antibody retrieval (>98°C, 20min). 3, secondary antibody was diluted at 1:200 (room temperature, 30min). Negative control was used by secondary antibody only. Fig.4. 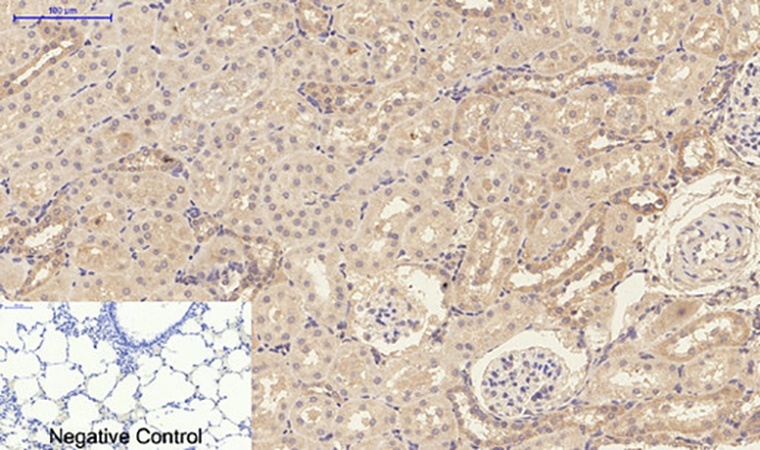 Immunohistochemical analysis of paraffin-embedded rat lung tissue. 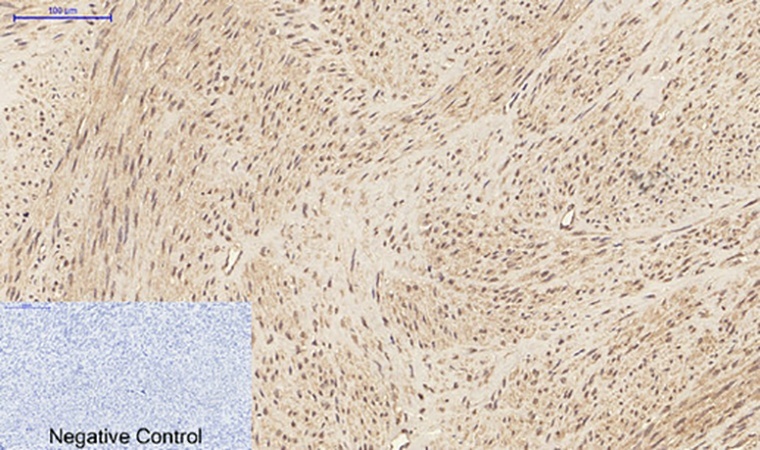 1, IL-1β Polyclonal Antibody was diluted at 1:200 (4°C, overnight). 2, Sodium citrate pH 6.0 was used for antibody retrieval (>98°C, 20min). 3, secondary antibody was diluted at 1:200 (room temperature, 30min). Negative control was used by secondary antibody only. Interleukin-1 beta encoded by IL1B is a member of the interleukin 1 cytokine family. This cytokine is produced by activated macrophages as a proprotein, which is proteolytically processed to its active form by caspase 1 (CASP1/ICE). This cytokine is an important mediator of the inflammatory response, and is involved in a variety of cellular activities, including cell proliferation, differentiation, and apoptosis. The induction of cyclooxygenase-2 (PTGS2/COX2) by this cytokine in the central nervous system (CNS) is found to contribute to inflammatory pain hypersensitivity. This gene and eight other interleukin 1 family genes form a cytokine gene cluster on chromosome 2. 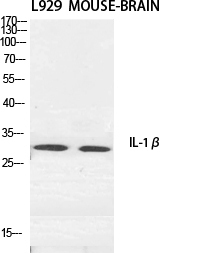 IL-1β Polyclonal Antibody detects endogenous levels of IL-1β protein.